Individual stars in the Milky Way and the galaxies nearby can be resolved by the LSST. These stars then provide a fossil record—a Rosetta Stone—that can be decoded to determine how these galaxies were formed. LSST will revolutionize the study of this fossil record. 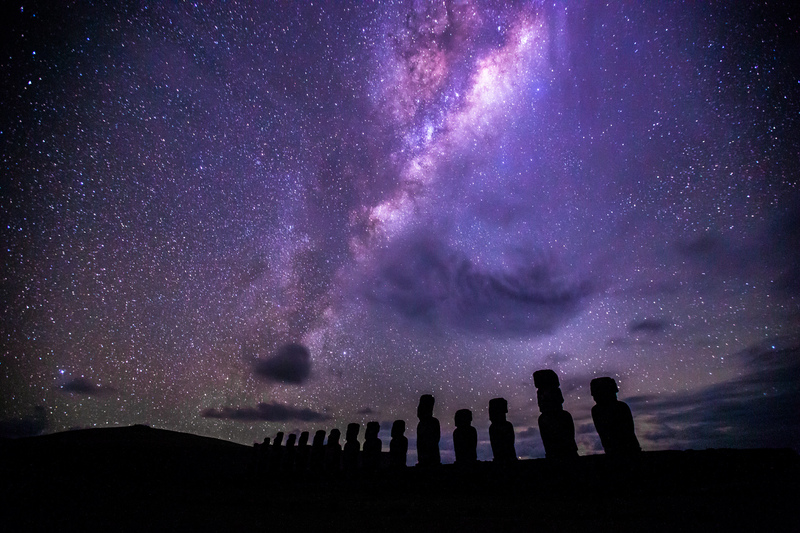 Moai under the Milky Way, Ahu Tongariki, Easter Island. Astronomers who study the growth and evolution of galaxies would seem to have an advantage over colleagues who study such topics as black holes or the Big Bang. After all, our sun, considered a fairly typical star, is a member of the Milky Way—a fairly typical spiral galaxy. And as a fairly typical galaxy, the Milky Way should serve as an example for the general study of the growth and development of galaxies throughout the universe. What is the structure and evolutionary history of the Milky Way? What are the fundamental properties of all the stars in the neighborhood of our Sun? The basis for our answers: the LSST's gargantuan and exquisitely accurate collection of data. The LSST will survey at least half of the sky and will make hundreds of observations of each surveyed area of sky. A single visit of the entire survey area will map more than 10 times the volume of past surveys. When stitched together in time, this set of observations will yield the motions of millions of Milky Way stars; when stacked in depth, a map over 1000 times the volume of past surveys, cataloging the colors and brightnesses of billions of new stars. Our modest galaxy and the surrounding cosmic neighborhood are laboratories for testing how stars form over a range of timescales, within a variety of masses of dark matter halos, in different environments in the early Universe, and with different interaction histories. With the LSST, we could find answers to some of the Universe's big questions right here in our own backyard.